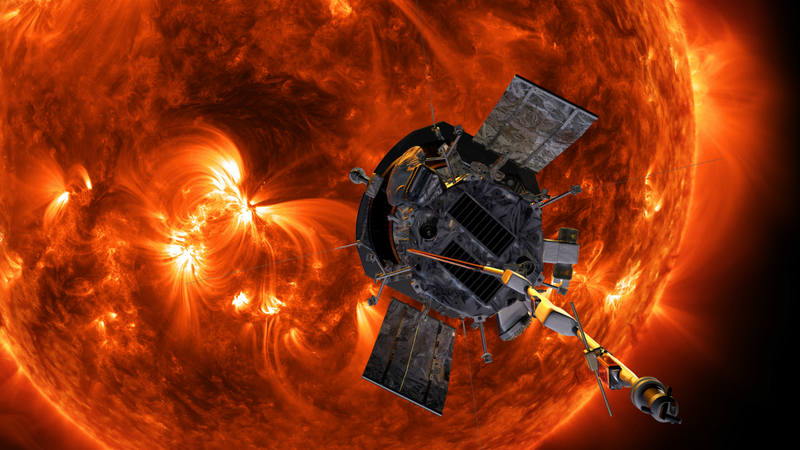 On Nov. 16, Parker Solar Probe reported that all systems are operating well in the first detailed performance and health update sent to Earth by the spacecraft since its first solar encounter. At about 6:00 p.m. EST on Friday, Nov. 16, mission controllers at the Johns Hopkins Applied Physics Lab in Laurel, Maryland, received the report from the spacecraft, which also included information about the data collected by the four instrument suites during its first solar encounter. Parker Solar Probe’s first solar encounter phase took place Oct. 31 – Nov. 11, culminating in its first close approach to the Sun — called perihelion — on Nov. 6 at just 15 million miles from the Sun’s surface, the closest any spacecraft has ever come to our star. All Parker Solar Probe systems are operating well and as designed. The solid state recorder on the spacecraft indicated that, as planned, the four instrument suites had recorded a significant amount of data, which is scheduled to be downloaded to Earth via the Deep Space Network over several weeks starting Dec. 7. In addition to helping scientists begin to explore fundamental questions about the physics of our star, the data from this initial perihelion — collected closer to the Sun than any before — will help instrument teams calibrate Parker Solar Probe’s instruments and plan future observations. During the 11-day solar encounter, the spacecraft executed only one autonomous momentum dump – a procedure in which small thrusters are used to adjust the speed of Parker’s reaction wheels. The rate of spin of the wheels is adjusted to maintain the desired orientation of the spacecraft relative to the Sun. Momentum dumps are expected during solar encounters, as the wheels spin up to counter increasing torque from the gravitational effects of the solar environment. Executing only one dump indicates that the spacecraft is well balanced, minimizing the need for these dumps during future solar encounters, which will save propellant. Parker Solar Probe’s second perihelion will occur on April 4, 2019. During the seven-year mission, the spacecraft will perform a total of 24 perihelia, with the last three bringing the spacecraft to less than 4 million miles from the Sun’s surface.